Lebanese singer and actress Sabah, who shot to fame in Egypt in the 1950s, died early Wednesday at the age of 87. Born in 1927 as Jeanette Gergis Al-Feghal, known as Sabah and nicknamed Al-Shahroura (the singing bird), she was one of the most celebrated icons of the golden age of music and cinema in the Arab world. The "Diva of Music" was discovered by Egyptian director Henry Barakat, who gave her a role in Al-Qalb Laho Wahed (The Heart Has Its Reasons, 1945). Her mesmerising talent in singing and acting kept her extremely busy, especially at the beginning of her career. From the 1940s through the 1960s, Sabah was appearing in up to six films each year. Among her best-known roles from this period were in Serr Albi (1946), Awal Nazrah (1947), Sharia El-Hob (1959) where she acted alongside celebrated Egyptian singer Abdel-Halim Hafez, Paris Wel Hob (1971), El-Aydi El-Naema (Soft Hands, 1963) directed by Mahmoud Zulfikar, and Rehlet El-Saada (Trip of Happiness, 1972) in which she starred next to Farid Shawqi. Her later important movies include: Laila Baka Fiha El-Qamar (1980), Al-Makhtouf (1983), Eyam El-Lolo (1989). Sabah remained active until the late 1980s, followed by less frequent appearances in films and on television until the early 2000s. Throughout her long career, she starred alongside big names such as Abdel-Halim Hafez, Kamal El-Chenawi, Ahmad Mazhar, Rushdy Abaza and Hussein Fahmy. 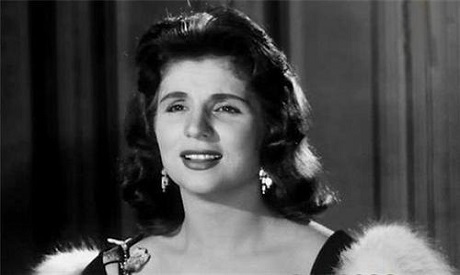 She sang over 3,500 Egyptian and Lebanese songs and played roles in over 80 Egyptian films, some of which were blockbusters in the 1950s and 60s. In 1990, Sabah and her former husband, Lebanese artist Fadi Lebnan, made a documentary about her life. In the first decades of her career, Sabah spent a lot of time in Egypt, where many of her movies were produced. She settled permanently in Lebanon in the 1990s yet continued to visit Egypt whenever invited to take roles in films and TV series. Her life was portrayed in El-Shahroura, a 2011 TV series produced by Cedars Art Production, a Lebanese company. The 30-episode series was written by Fedaa El-Shandawili and directed by Ahmed Shafiq. Carole Samaha portraying Sabah starred alongside 125 actors from Lebanon, Egypt and the Arabian Gulf. Not only a star in Arab countries, Sabah also performed concerts at Piccadilly Theatre in London, Sydney Opera House, and Carnegie Hall in New York. Sabah was honoured at the Dubai International Film Festival, the Egyptian Cinema in Cairo and the Beiteddine Art Festival. She held Lebanese, Egyptian, Jordanian and US citizenship. A large spotlight was always shone on her personal life. She was married several times, with sources reporting on seven and even ten marriages, and most of her husbands were from artistic circles. Sabah has a son from her five-year marriage to Najib Chammas and a daughter from her four-year marriage to the Egyptian violinist Anwar Mansy.